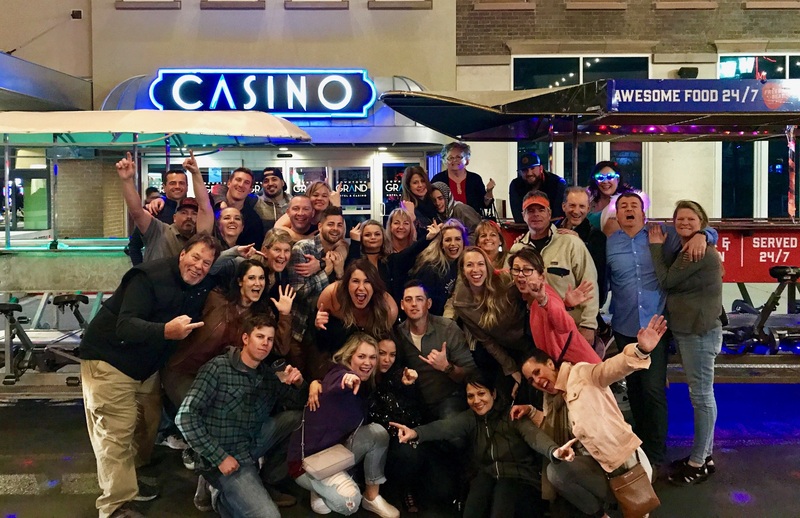 When traveling to Las Vegas, there are so many attractions and shows to choose from, but if you want a real local Downtown experience, you have to book a ride with Vegas Pub Crawler. All you have to do is follow the four steps to book. Secret tip #5 if you make it to the end! Do you want to drink and be merry?! This axiom is possible on our monstrous cycle that can host up to 15 riders. The minimum amount for a group is six riders. But who shoots for minimums? Gather your best compadres for some excellent Downtown Las Vegas fun. And with all the hot spots on the trek, the party on this pub crawler won’t stop til you get enough! Block out the date and time that you are ready to ride! It’s so simple. Just go to the “book” page and reserve using our easy to use booking features. Optimal riding times are on the weekends to see the drunken debauchery that happens Downtown. But if you want to avoid lines at the bars, weekdays may be more your speed. Check out all the specialty tours the pub crawl offers. Do you have a must-see bar Downtown? You can choose the pubs you want to visit on your pub crawl journey! Not sure which ones to pick? We have the DTLV experts who will guide you to whatever alcoholic environment you fancy. Just make sure you ask when you call for our best recommendations. You are now ready to ride! You and your group will meet at 206 N. 3rd Street in Downtown Las Vegas at the Downtown Grand’s Furnace Bar. It’s easy to find the spot that will set the trail and the tone for your night of debauchery.